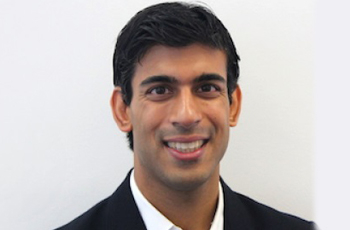 Rishi Sunak has served as Conservative MP for Richmond (Yorks) since 2015. Recently in the June 2017 General Election, Rishi received 36,458 votes, which equaled a 63.9% majority, retaining his seat. Rishi is a hedgefund manager from Hampshire, where his father is an NHS family GP and his mother runs her own local chemist shop. Rishi studied at Oxford University and Stanford University - an experience that resulted in his passion for ensuring everyone has access to a quality education. Since becoming a MP Rishi has spoken on school funding, child benefits and many more issues. He is a school governor, a board member of a large youth club, and volunteers his time to education programmes that spread opportunity. The 34-year-old surprised many commentators by being selected to contest the country's safest Tory seat currently held by the soon-to-be retiring William Hague. His career with the Tories amounts to a week of work experience in Conservative Central Office; whereas other hopefuls from all the big parties have often worked as researchers, party officials and special advisors before seeking election.